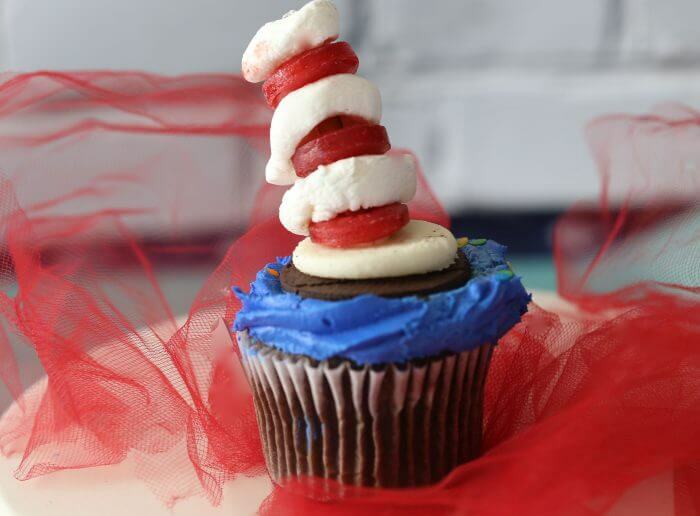 I love Dr. Suess cupcakes. I am working on ways to be the it mom. 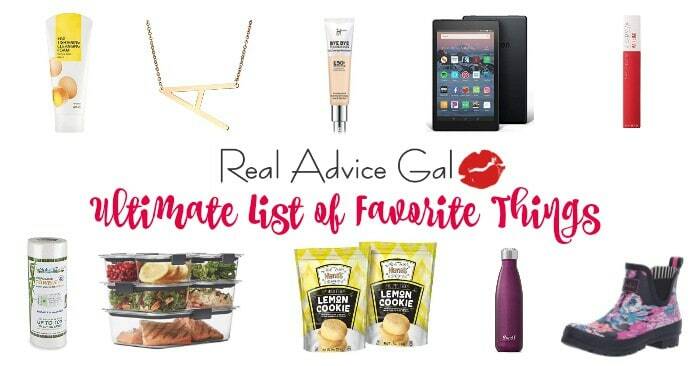 You know the one that sends in the fancy pinterest worthy treats to school. The problem is I am not able to do those things. I have to much to do. I figured out a way to participate by cutting corners but not cutting out the fun. These are Cupcake Recipe for Kids, all are super simple “recipes” that anyone can make. They are cupcakes for the Reading Across America party and they are also cupcakes that my kids were able to decorate. I love the fact that my children get to learn facts about Dr. Seuss and spend time reading. This is one of my favorite Dr. Seuss books of all time. This is also and easy cupcake to decorate. Two fish and a red fish…. Do you not think a class of kids would love these. They are a nut free kids treat. You know we all have these laying around. This is an easy cupcake to decorate. The youngest child can help you with this design. The Lorax is one of my favorite stories and cupcakes. 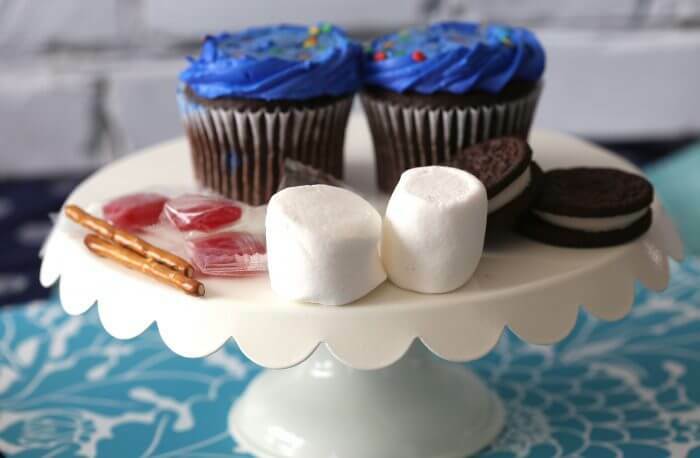 You will need to add a cupcake liner to your store bought cupcake. 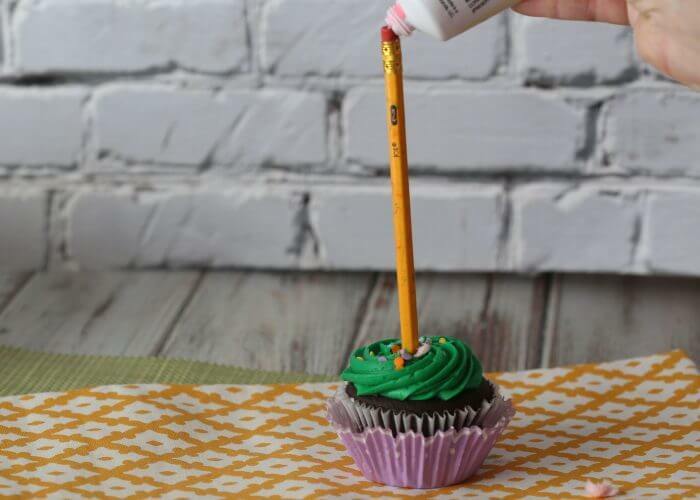 Then place a pencil in the center of the cupcake. Then place icing on the eraser of the pencil to secure the cotton candy. This will be a crowd pleaser. It is very yummy and easy to make. The Cat in the hat and I had three ideas for that… Oh, I can rhyme as well as make up quick recipes you and your kids can do. Make sure you eat the oreo lid that is part of the fun and oreos are great for a nutfree school. Put the pretzel in the icing and use it to anchor the cut marshmallow and then the lifesaver. You repeat until you get a hat like shape. 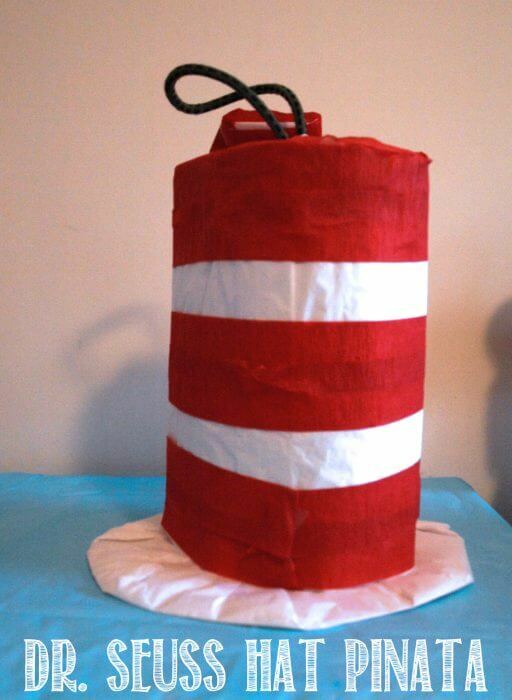 This is what you need to make thing 1 and thing 2. I got the cotton candy at Dollar General for $1. You can also buy it at The Dollar Store. You will need to make signs that say thing one and thing 2. You will secure them with tape on a toothpick. You can use a pretzel stick if you wish. Then you will need to place the cotton candy on the top of this awesome store bought cupcake. The bigger the “hair” the better. Then add the candy eyes. If you do not have candy eyes small marshmallows and black icing will work! The cupcakes are finished off with the tags. Here is another idea for a hat if you are worried that life savers are not okay for the children that are going to receive the cupcakes. Slice the berries and the marshmallows to create an alternate pattern. Then place the tooth pick in the middle a pretzel can be used as an alternative. These are so much fun. The icing will be used to secure the top of the strawberry. The best part is this is amazingly easy to create and they taste great. These are also a great fourth of July cupcake. The first cupcake that we made was the OObleck cupcake…. and guess what I used the recipe for making glowing cupcakes. They taste great and they can be seen in the dark. Make reading more fun for kids, get our FREE printable Dr Seuss for Kids. 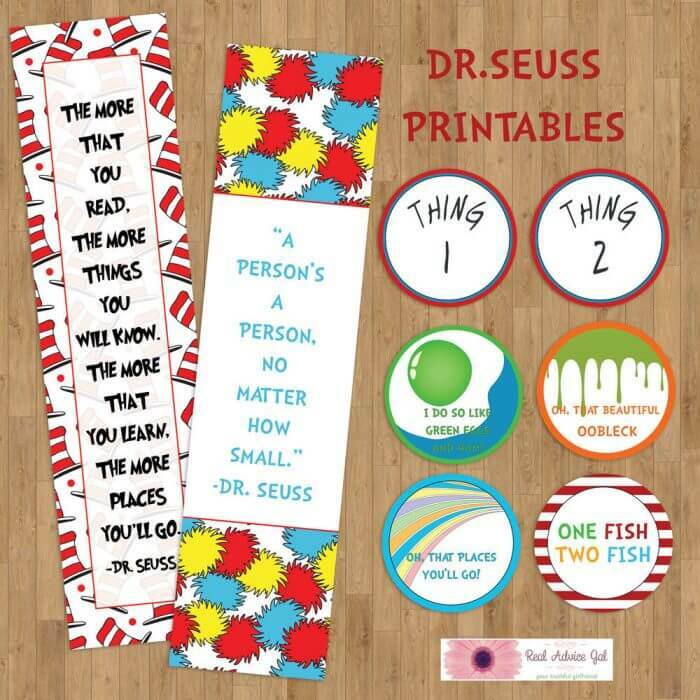 This set includes bookmarks and cupcake signs. I hope you enjoyed my Dr Seuss Cupcakes make sure you pin them please. Kid Cupcake Recipes: Ice Cream Cone Cupcakes! 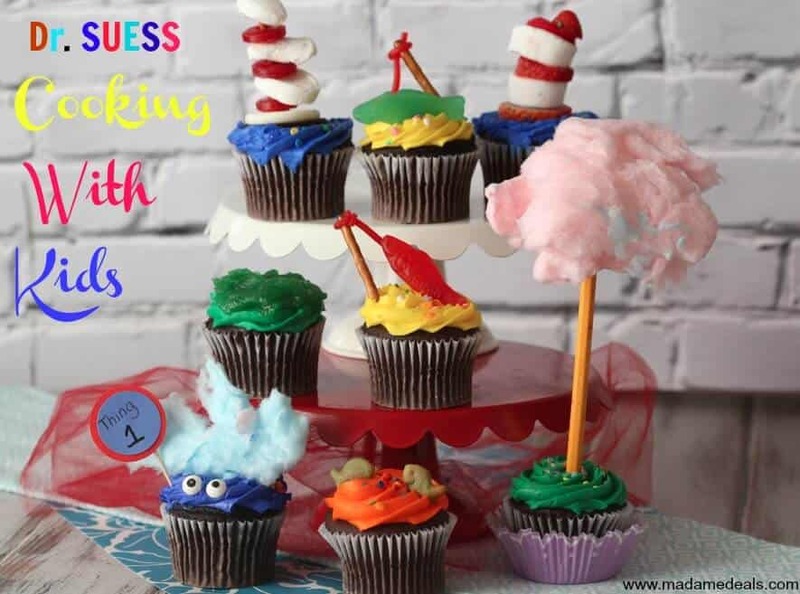 Do you love our Dr Seuss Cupcakes? Share us what you think below.